Who is Kimberly Anne Scott and What is Her Relationship With Eminem? Home Celebrities Who is Kimberly Anne Scott and What is Her Relationship With Eminem? In this age where love no longer last “forever after”, it is nice to see a couple who despite suffering from an intense love-hate relationship, still try to build a comfort zone around each other. This is why we are focusing on the unfulfilled love story of Kimberly Anne Scott’s and her lover whose relationship got ruined by the same music that started it in the first place. Who is Kimberly Anne Scott? Kimberly Anne Scott is a writer who writes puzzles, greetings cards and children books. She is also a freelance illustrator. However, she became tremendously famous for her tumultuous relationship with the legendary rapper, Eminem. She was born on the 9th of January, 1975 to Kathleen Sluck and Casimer Sluck. She is of white descent and her nationality is American. Kimberly grew up in Michigan, the United States which is also her birthplace. She had a twin sister, Dawn Scott who passed on as a result of a heroine overdose in early 2016. Growing up, Kimberly and her twin had a troubling childhood. They had to deal with an alcoholic stepfather who even abused Kimberly sexually. As a consequence, she and Dawn ran out of their house to escape their stepfather’s abuse. They stayed at a Youth home in 1998 but later moved in with Eminem and his mother, Debbie Nelson. 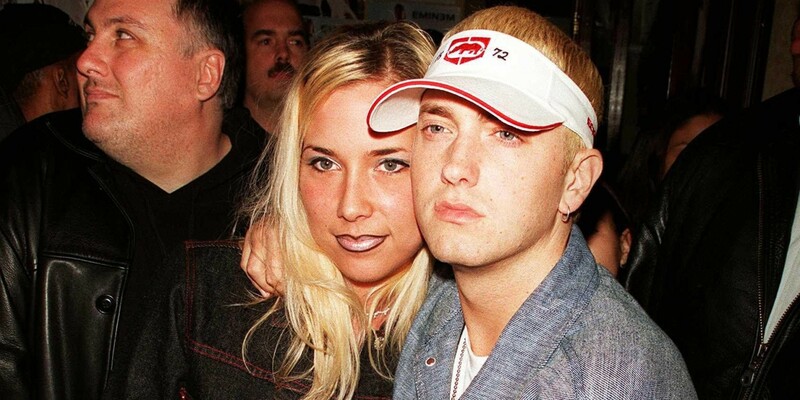 Kimberly Anne Scott and the award-winning rapper, Eminem met each other by sheer fate. While at the Youth Home, Kimberly never got out but the first day she left for a friend’s party, he met Eminem. Kimberly was 13 then while the legendary rapper was 15. She saw him standing on top of a table singing one of LL Cool J’s tracks “I Am Bad”. They got talking and in a remarkable twist of fate, it happened that Eminem shares almost the same childhood experience with her having been abandoned by his father. Their friendship blossomed from the party and it didn’t take long before Eminem allowed her into the home he lived with his mother. They soon became high school sweethearts. Eminem who was all about rap then abandoned school at 9th grade to focus on odd jobs that could help him foot his bills and pursue his career in music industry. In 1995, while Eminem was still combining menial jobs and unsatisfying career, Kim got pregnant unexpectedly. She had Hailie, their first child the same year. But even before their child came, their relationship was not without trouble. They fought and made up. In the same manner, they spewed hatred and love towards each other. As time passed, the rapper resorted to expressing his deep repugnance for her via his songs. In 1999, Eminem released a song title 97, Bonnie & Clyde which, described his intense disgust for Kimberly. On different occasions, most close friends to the duo thought it was going to be over between them especially for the multiple breakups and makeups. But the couple always rekindled their love. They later got married and Kimberly became “Kimberly Mathers”. But the marriage failed only two years. The problem started primarily because Eminem was still performing 97 Bonnie & Clyde which had already enraptured Eminem’s fans. Kimberly who didn’t like the way she was portrayed in the song felt frustrated. This led to many troubles and arguments including a suicide attempt on the part of Kimberly. In 2000, he also did a song titled “Kim” through which he put together his hatred towards her. Just about the same period, Eminem caught Kimberly kissing a mutual friend and filed a divorce in 2001. Downhearted Kimberly started over-indulging leading to her arrest the same year. She was accused of consuming cocaine but was not convicted. The author/writer picked the pieces of her life and started a new life with Eric Harter. The relationship produced one daughter, Whitney in 2002. In 2003, she was arrested for drug possession and having a suspended driving license. Eminem, on the other hand, dropped two more songs (Crazy in Love and Puke) still talking about his ex. At this point, many thought it was all over. Apparently, Kimberly and Eminem were yet to get over each other. After her release, they got back together in 2006. This time their relationship lasted for just a month and a few days. Kimberly became depressed and even attempted to take her life once again. She also fought substance abuse and went on one-year probation with drug and alcohol counseling. Despite their divorce, they both have a cool relationship now. They co-parent their children including Hailie Jade Mathers, (biological to both) Whitney Scott Mathers (biological to only Kimberly and adopted by Eminem) and Aliana Marie Mathers (adopted by both because of the death of her mother Dawn Scott, Kimberly’s twin sister, who died due to drug abuse).